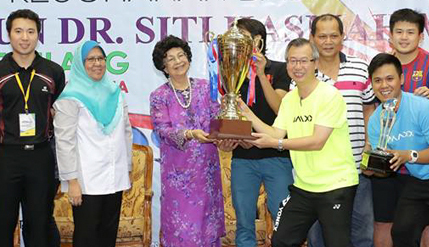 BANGI, 4 May 2014 – Multimaxx Ipoh won the Men’s Doubles in the Tun Dr Siti Hasmah Mohd Ali Badminton Championship 2014 held at the Dewan Gemilang of The National University of Malaysia (UKM) here today. They beat the Navy A team despite having 2003 All England Champion Muhammad Hafiz Hashim in the finals. Close to 40 teams took part in the four day championship which ended today, a platform to draw out young and up and coming badminton players. Multimaxx Ipoh received the Championship Trophy, medals, gifts, a hamper and a cash prize of RM2000 while Navy A received medals, gifts, a hamper and cash of RM1000. AD Badminton Academy 1 and AD Badminton Academy 2 were joint third. They each took home medals, gifts, a hamper and cash prizes of RM500 each. The prizes were handed over by Tun Dr Siti Hasmah Mohd Ali who was accompanied by Deputy Vice Chancellor (Student and Alumni Affairs) Prof Datin Noor Aziah Hj Mohd Awal.